Many companies provide products and services in the big data arena, and I read new articles about marketing data and analytics nearly every day. But two things are almost always missing. In our view, today’s marketer should be all about the customer journey and the surrounding analytics. On the surface, focusing on the customer journey may sound like nothing more than the latest marketing fad. Companies have embraced a customer focus for decades. And the idea of “one-on-one” marketing is easily a decade old. The “customer journey” concept is directly tied to today’s world: multi-channel, multi-interface, high tech, low tech, and so on. The challenge is to instantaneously understand and strengthen current and future customer experiences as they move from one touchpoint to the next. The second missing piece involves analytics. The ubiquity of conversations about “big data” misdirects our attention. Who cares about more data if we don’t make better decisions? Nor is the answer “be sure to gather data that supports your analytics.” The marketer’s challenge is to define the key decisions they must make about customer journeys. For example, take short-term tactical marketing decisions. If a customer received a mail drop 10 days ago and just researched a particular product of yours on their laptop, what comes next? Should you wait and see what they do, send an email, or text a price feature? Short-term tactical decisions about customer journeys are greatly informed by the persona concept. They capture preferences and tendencies for customers as they move through their journeys. So if the buyer’s persona is to be a highly independent shopper who responds negatively to all forms of unsolicited electronic contact, then the best option is to wait and see what happens next. But if prior purchase behavior tells you this customer only buys when products are on sale, then maybe they have a price-buyer persona and the next step should be to text them a discount offer. As you can imagine, there are numerous buyer personas and they reflect your particular industry, brand, channels, and so on. Customer personas can change based on their prior experience with you, competitors or the world around them. Further, your information about a customer should improve over time. When you have your first contact, you may have a very weak hypothesis about their persona based on their demographics or the product they are investigating. But, as you have more touchpoints, your confidence increases. What are our customer personas, how do their journeys tend to differ, and what drives the probability of an accurate persona assignment? How does the probability of a sale progress over time for each persona? For each persona, which touchpoints make the strongest contributions to the probability of a sale? For each persona, which touchpoint sequences have the highest probability of a sale? For each touchpoint, what are typical engagement levels, and how do deviations impact the probability of a sale? What is this particular customer’s likely persona, likely journey position, and current probability of a sale? Based on our confidence in the above answers, what sequence of touchpoints maximizes the probability of a sale, and what needs to happen next? Perhaps on a semiannual or annual basis we would then revisit the first set of analyses, refine our answers, and reset the instantaneous decision parameters. This define, execute, optimize approach is summarized below. The marketing imperative is clear. 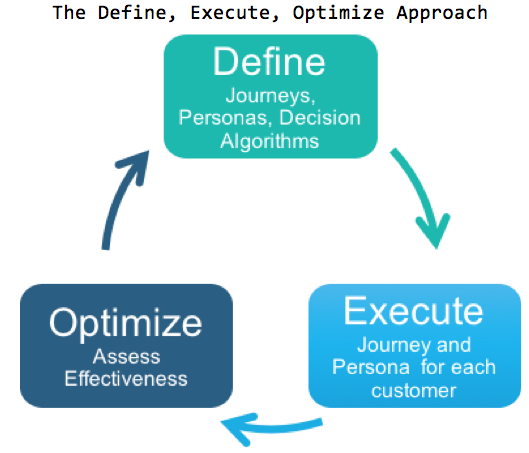 Businesses must define, execute and optimize their customer journeys by developing actionable insights from big data and create smarter customer interactions at every point along the customer journey. The result is improved marketing performance and stronger customer relationships. Frank Grillo is the CMO of Harte Hanks. He is a passionate advocate of understanding and optimizing customer journeys and associated analytics.